London July 13 (IANS) US President Donald Trump has warned that the UK will "probably not" get any future trade deal with the US if it goes ahead with Prime Minister Theresa May s plan for post-Brexit ties with the European Union. 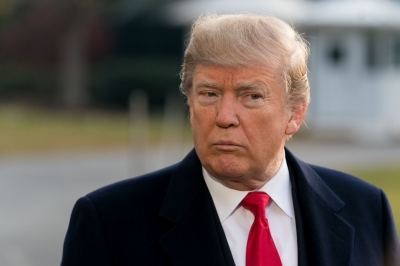 In an interview to The Sun tabloid published late on Thursday the US President said May s plan would "probably kill the deal" as it would mean the US "would be dealing with the EU" instead of with the UK. Trump praised May s Conservative Party rival and former Foreign Secretary Boris Johnson and said he would make a "great Prime Minister" adding "I think he s got what it takes". Johnson disagreed with May on Brexit and resigned earlier this week. There was no immediate response from Downing Street. The interview was published as Trump and May were wrapping up their dinner at Blenheim Palace where they had walked inside holding hands. The President and First Lady Melania Trump will meet Queen Elizabeth II on Friday before flying to Scotland to spend the weekend at Trump s Turnberry golf resort. In the interview done earlier this week Trump disparaged May s Brexit plan: "I would have done it much differently. I actually told Theresa May how to do it but she didn t listen to me... She wanted to go a different route. The deal she is striking is a much different deal than the one people voted on." Trump also said he was "cracking down" on the EU as "they have not treated the US fairly on trading". If May has Britain align its rules and regulations for goods and agricultural products with Europe following "a common Â­rule book" with Brussels as she puts it then Trump said that could derail a trade deal with Washington. May has been making the case for a US free trade deal with Trump on his first UK visit as President. On Thursday she said Brexit was an "opportunity" to create growth in the UK and US. In the interview Trump also renewed his criticism of London Mayor Sadiq Khan over last year s terror attacks in the capital saying he had done "a terrible job". In response Khan said it was "interesting" that Trump was "not criticising the mayors of other cities" which had also experienced terror attacks. After the interview was published White House spokeswoman Sarah Sanders said the President "likes and respects May very much" adding that he had "never said anything bad about her". Trump also told the Sun that he was not spending much time in London because he did not feel "welcome" due to mass demonstrations. A giant balloon depicting the President as a baby took flight over the British Parliament on Friday kicking off widespread protests against his visit to the UK.